From the highly acclaimed author of When She Flew and Riding With the Queen, a powerful new novel that asks how well we know the people we love—and how well we know ourselves. Jennie Shortridge has published five novels: Love Water Memory, When She Flew, Love and Biology at the Center of the Universe, Eating Heaven, and Riding with the Queen. When not writing, teaching writing workshops, or volunteering with kids, Jennie stays busy as a founding member of Seattle7Writers.org, a collective of Northwest authors devoted both to raising funds for community literacy projects and to raising awareness of Northwest literature. "A wonderful book; lovely....just perfect." 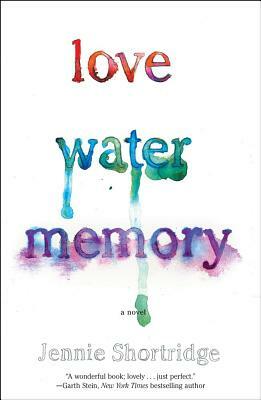 "Love Water Memory is a beautiful novel about what the mind forgets and what the heart remembers. A story of memories as shadows, elongated and distorted by time, until they eclipse cherished loves, familial connections, and painful truths. A captivating read from start to finish." "By the end of page one of Love Water Memory, readers care about Lucie and why she's standing in frigid San Francisco Bay in an Armani suit. Jennie Shortridge's fifth novel moves like a thriller, as along with Lucie we discover what led to her flight from her fiance Grady and her high-powered career. In the hands of a less accomplished author the plot could have become maudlin. Here, it’s credible; Grady is loving but flawed; the pre-amnesiac Lucie not always likable. But they fight for understanding and happiness, and readers will be cheering for them all the way." "Love Water Memory is slowly and sweetly revelatory as Lucie, coming out of the fog of amnesia, and Grady, finally swimming to a surface without his father, move toward each other in a new recognition of themselves and each other, leaving behind disguises they no longer need. There is laughter and there are tears as these two people learn to trust each other and to be fearless in finding a better, more honest way of loving than what they once knew." "Engaging characters, beautiful settings, and a story that keeps the reader’s interest from the very start. Lucie ran away from her fiancé 8 days ago, now she has no memory of who she is or anyone else either. Grady is coming to get her, but he would just as soon Lucie not remember the day she ran. Aunt Helen holds the secrets of a childhood gone terribly wrong. As the characters face the challenges from the past and present, the reader will be rooting for them. These are characters that make you care and a plot line that will not let you go." Shortridge (When She Flew) proves herself in her fifth novel. This is thoughtful, with fully developed characters all around. "Shortridge’s novel is a poignant examination of the effect of the past, subtle variations of the truth and what it means to love another person."